The study of the Russian mammals was started shortly after the foundation of the Russian Academy of Sciences in 1783. The first zoologists who investigated the Russian mammals were D.G. Messerschmidt, S.P. Krasheninnikov, G.V. Steller. The Peter Simon Pallas's ( Pallas, 1811 [34,5 Mb]) study was of especial importance for the investigation of the Russian mammals. In paerticular, Pallas described many species of insectivores, rodents, and hoofed mammals. He was first who wrote about remains of fossil mammals, such as wooly rhinoceros (Coelodonta antiquitatis) and European bison (Bison bonasus). The founding of the Zoological Museum (Institute) in XIX century promoted a widely study of mammalian fauna of Russia and was connected with names of prominent zoologists such as F.F. Brandt (1802-1879) (Brandt, 1864 [2,6 Mb]. ), I.S. Poliakov (1847-1887), N.M. Przhevalsky (1839-1888), V.V. Zalenskii (1847-1918), and N.V. Nasonov (1855 - 1939). A.A. Bialynitskii-Birula (1864-1938) was Chief of the Laboratory of Terrestrial Vertebrate Animals in Zoological Museum (Institute) which included as part Mammals Study Group. In this Group worked V.I. Gromova, G.P. Adleberg, A.I. Argiropulo, K.K. Flerov and others famous zoologists. 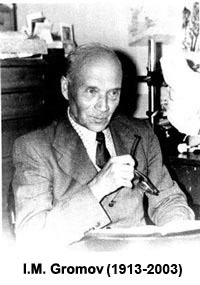 Professor Boris S. Vinogradov (1891-1958) was founder of Saint-Petersburg's theriological school. 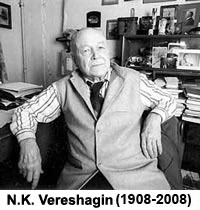 He was recognized authority in the rodent systematics (Vinogradov, 1937 [5Mb]; Vinogradov et Argiropulo, 1941 [6Mb]). Vinogradov published monographs "Animal World of USSR" and identification guides. Selected pictures from the Peter S. Pallas's monograph "Zoographia rosso-asiatica" (1811). The Laboratory of Theriology was established as a separate structure in the Zoological Institute since 1968. In different periods the position of the Chief of laboratory was occupied by N.K. Vereshagin (1968-1974), I.M. Gromov (1974-1980), I.M. Fokin (1980-1998). 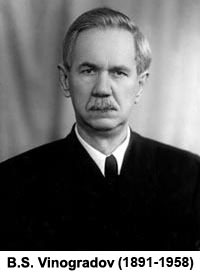 Since 2000 till present the Laboratory Chief is Alexander O. Averianov. In laboratory worked famous zoologist, such as N.V. Nasonov, G.P. Adlerberg, K.K. Flerov, I.I. Sokolov, and I.E. Kuz'mina (Hoofed Mammals); G.A. Novikova and N.K. Vereshagin (Carnivores); N.A. Smirnov, K.K. Chaptskii and A.A. Aristov (Pinnipeds); A.A. Gureev and M.V. Zaitsev (Lagomorphs and Insectivores); A.I. Argiropulo, N.N. 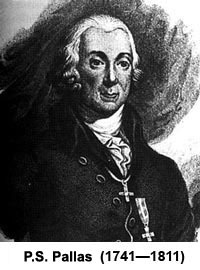 Vorontsov, I.M. Gromov, and M.N. Meyer (Rodents); P.P. Strelkov (Bats). V.E. Garutt studied extinct elephants, include mammoths. Functional morphology in laboratory was studied by A.S. Sokolov, R.S. Poliakova, A.A. Aristov, and G.E. Zubtsova. At present the Laboratory of Theriology includes three Work Groups. Systematics and Phylogeny of Mammals Group contains the specialist on small mammals (bats, rodents, and insectivores). 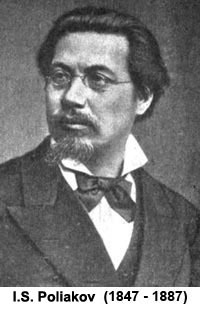 Within this Groups Igor' M. Gromov was a founder of Leningrad's Systematics School. Studies of systematics and phylogeny of mammals in different periods wre conducted by A.O. Averianov and A.E. Bobal' lagomorphs); M.V. Zaitsev (1954-2005), V.A. Osipova and L.L. Voyta (insectivores). This Group also has been investigating the problems of speciation of small mammals. Marina N. Meyer (1927-2001) developed integrated approach to speciation analysis which based on the karyology, molecular studies, hybridization analysis, and morphometry. F.N. Golenishchev and V.G. Malikov using this approach at present. Peter P. Strelkov is a famous specialist who studying systematic and ecology of bats. His works are widely knows. Fauna History Group contains the specialists who study systematics, zoogeography, and morphology of Recent and Pleistocene's large mammals, such as mammoths and other members of extinct mammoth's fauna, extinct and extant members of carnivorous and hoofed mammals. In the different periods in this Group worked N.K. Vereshagin (1908 - 2008), I.E. Kuz'mina and A.N. Tikhonov. At present G.F. Baryshnikov, A.V. Abramov, M.V. Sablin and E.V. Syromyatnokova are working there. Traditional morphological investigations are associating with molecular studies of ancient DNA. This co-studying are enabled reveal new way of evolution within carnivores (Canidae and Ursidae). G.F. Baryshnikov was awarded the E.N. Pavlowskii Academic Prize in 2011. Functional Morphology Group includes specialists which works with masticatory and locomotory apparatus of different groups of mammals. Peter P. Gambarian's work on the run of mammals, facial muscles system and reconstructions of muscles system in extinct groups (Multituberculata) is now set for worldwide recognition. On the most important tasks of the Laboratory of Theriology is producing of the identification guides to the fauna of Russian and adjacent countries (former USSR territory). In the Series "Identification Guides to the fauna of USSR" five monograps have been published. At present in the New Series of the "Identification Guides to the fauna of Russia and adjacent countries" three monographs describing lagomorphs and rodents ( Gromov & Erbaeva, 1995), carnivores including pinnipeds ( Aristov & Baryshnikov, 2001), and hoofed mammals ( Baryshnikov & Tikhonov, 2009). Additionally the Laboratory researchers produced ten fundamental monographs in the Series "Fauna of the USSR", currentlty the New Series "Fauna of Russia". At present specialists are compleating the following monographs from these series.